Tomorrow, Saturday, February 27, 2016, is the date, and 11 a.m. is the time — and that’s US Eastern standard time, folks, no matter where The Legal Genealogist happens to be right now — and you will be so sorry if you miss out on this one. Because that’s when registration opens, online, on the registration page for the inaugural 2016 year of the newly-revised newly-renamed Genealogical Institute on Federal Records (Gen-Fed). This is the successor to the National Institute on Genealogical Records (NIGR) that so many of us have known and attended and loved — and it continues to offer an unparalleled opportunity to spend a week at the U.S. National Archives in Washington, D.C., learning the ins and outs of federal records research at both Archives I in downtown Washington and Archives II in College Park, Maryland. It’ll be held Monday, July 11 through Friday, July 15, 2016, kicking off with a required evening orientation on Sunday, July 10. It sports a new name in 2016 as it returns after a year hiatus caused by the sudden and unexpected death of director Patricia O’Brien Shawker. 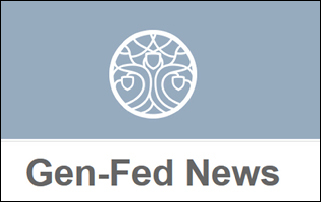 It’s now the Genealogical Institute on Federal Records; it has a new nickname — it’s now Gen-Fed; it has a new website (check it out here); and registration for the first time will take place online (see the registration info on the registration page). Now… because the online registration is new this year, there could well be glitches. So read the directions, thoroughly and carefully, before 11 a.m. on Saturday. There are some things you can do in advance to be ready to move ahead in the registration process, like writing out a brief bio, and you definitely want to be able to move ahead. Why? Because (a) space is always very limited, (b) demand is always very high, and (c) demand is likely to be even higher than usual this year because of the pent-up demand from not having had the institute in 2015. Because Gen-Fed is, as it’s always been, one of the very best offerings in genealogical education that can be found. With a history extending back to 1950, with its singular focus on federal records, with its hands-on opportunities to touch and feel and handle real records for our own families, with its stellar new director (Malissa Ruffner, JD, CG) and a stellar line-up of instructors (and yes, I’ll be one of them), this is something you just do not want to miss. So… mark your calendars. Tomorrow. Saturday. February 27, 2016. 11 a.m. Eastern standard time.